The Great Western Railway experienced the trauma and disruption of the end of the broad gauge in 1892 and were faced with equipping the network with suitable motive power, especially in Devon and Cornwall where the last track conversion had taken place. West of Newton Abbot, the GWR had relied on a variety of 4-4-0, 2-4-0, 0-4-2 and 0-4-4 side and saddle tanks, often doubled-headed, and Dean set about designing a sturdy outside-framed powerful 4-4-0 with 5ft 8in coupled wheels, the 'Dukes', to tackle increasing loads over the heavily graded main line. Then, Churchward came to assist the ailing Locomotive Superintendent, using his knowledge and experience of American and continental practice to develop the Dean designs. He improved the efficiency and performance of the boilers, using the Belgian Belpaire firebox, then developed the tapered 'cone' boiler, and applied it to the chassis of the 'Duke's to form the 'Camel' class, later known as the 'Bulldogs', which eventually numbered 156 locomotives. Finally, in the 1930s when engines of the 'Duke' route availability were still required but their frames were life-expired, their boilers were matched with the stronger frames of the 'Bulldogs' to form the 'Dukedog' class, which lasted until the 1950s, particularly on the former Cambrian lines in mid-Wales. 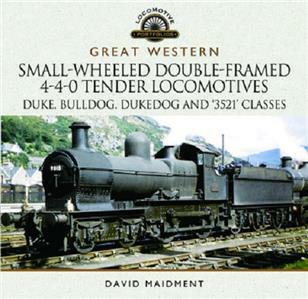 This book recounts the design, construction and operation of these small-wheeled outside-framed locomotives with many rare photos of their operation in the first decade of the twentieth century as well as in more recent times.